Global chronic disease management market expected to generate around USD 10.3 billion by 2024, at a CAGR of around 17.5% between 2019 and 2024. The growing invasion of chronic diseases along with the increasing awareness about the consequences of life-threatening diseases is estimated to drive the global chronic disease management market growth in the future. The report covers a forecast and an analysis of the chronic disease management market on a global and regional level. The study provides historical data from 2015 to 2018 along with a forecast from 2019 to 2024 based on revenue (USD Billion). The study includes drivers and restraints of the chronic disease management market along with the impact they have on the demand over the forecast period. Additionally, the report includes the study of opportunities available in the chronic disease management market on a global and regional level. In order to give the users of this report a comprehensive view of the chronic disease management market, we have included a competitive landscape and an analysis of Porter’s Five Forces model for the market. The study encompasses a market attractiveness analysis, wherein all the segments are benchmarked based on their market size, growth rate, and general attractiveness. 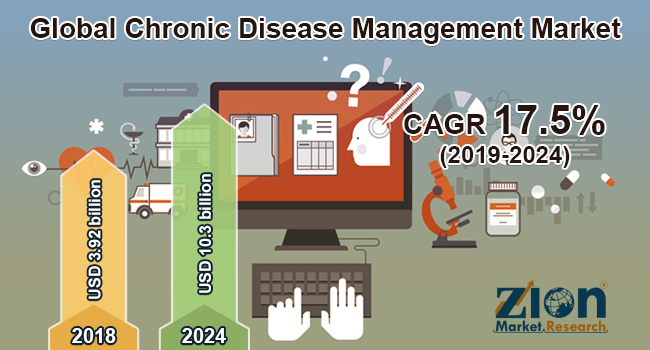 The study provides a decisive view of the chronic disease management market by segmenting the market based on disease type, delivery mode, service, end-user, and region. All the segments have been analyzed based on present and future trends and the market is estimated from 2019 to 2024. By disease type, the chronic disease management market is divided into arthritis, cardiovascular disease, cancer, and diabetes. By delivery mode, the chronic disease management market is bifurcated into cloud-based and on-premises. By service, the market is segmented into educational services, implementation service, consulting service, and others. The end-user segment of the chronic disease management market includes providers, payers, and others. Providers are further segmented into ambulatory care centers, hospitals, physician groups, and integrated delivery networks, diagnostic and imaging centers, home healthcare agencies, nursing homes, and assisted living facilities, and others. The payers segment is further divided into public payers and private payers. The regional segmentation includes the current and forecast demand for North America, Europe, Asia Pacific, Latin America, and the Middle East and Africa with its further divided into major countries including the U.S., Canada, Germany, France, the UK, China, Japan, India, and Brazil.